Last night Shakshi finished one of the Homework Passion Projects. She used crayons, a hot glue gun and a canvas. You can find the Homework Passion Projects on our Learning Portal. We talked about what we should do if we ever experienced an earthquake while in the classroom or outside. We showed what we would do if we experiences an earthquake while in the classroom. We also showed what we would do if we were outside and an earthquake happened. Congratulations to Caleb who received the Principal's Award for Room 15:Totara. He has been persevering with his writing. You can view his story for this week on his Individual Blog. Well done to Kade, Reece, Dalia, Madison and Joel. They have been demonstrating PRIDE by persevering in their Reading, Swimming, and Maths, as well as showing Empathy towards others. We have been putting together our class treaty over the last few weeks. We have talked with each other and completed many activities about our expectations. Congratulations to Troy who received our very first Principal's Award for Room 15: Totara. He has been demonstrating PRIDE in the classroom and being a really good role model for the rest of the class. Well done to Tristan, Caitlin and Anika who received PRIDE Certificates for their respect and perseverance they demonstrated in class. Also congratulations to Tyrel and ConnorT who received PRIDE Certificates for their diligence in their maths. Over the last few weeks we have been discussing our Classroom Expectations. We have been talking about what makes a good 'rule' to help us remember what is expected of us. We are using the ipads to create posters. We have used PicCollage and Explain Everything to create our Totara Treaty. Look out for our Treaty in the next few days. Here are some photos of us creating our posters. Over the last two weeks we have been busy learning about our PRIDE values. We have been working cooperatively with our groups. On Tuesday we learnt about working diligently. Here are some of the posters that were completed. We have enjoyed a week of getting to know each other and learning the PRIDE values in school. Our PRIDE Certificates have been awarded for demonstrating perseverance, respect, initiative, diligence and empathy. Well done to Madison, Joel, Tamzyn, Sienna-Nicole and Aila. 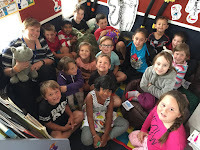 For the past week we have been finding out about each other in Room 15: Totara. We have been creating a piece of writing identifying what we like to look at, listen to, smell, taste and touch. We looked at a poem by Pie Corbett to help get an idea of how to write our own poem. To see our poems please click on the links of our individual blogs.